I was very excited on Sunday to make Dorie's Asparagus Soup. I like making a light and healthy meal on Sundays. I think it's a rebellion against my youth when Sunday was a day for a large meat and pasta meal followed by gorging on Italian pastries. We would spend the afternoon sitting in front of the TV in an insulin stupor. So, when I pulled out Around my French Table and started to read the recipe. "Using a vegetable peeler, peel the asparagus from about an inch..."
WHAT, I have 2 1/2 pounds of asparagus? "Bundle up the trimmings in a piece of cheesecloth and tie it like a hobo's sack..."
Where is the hobo train? I'm hopping on it right now. There is no way I'm doing all this "technique" for a Sunday soup. 1) In a large dutch oven or sauce pan on medium high heat the oil and butter. Saute the vegetables putting them in the pot in order of their thickness and cook time: onion, shallot, leeks, garlic, then asparagus, salt and pepper. Cook vegetables until they wilt. 2) Add 3 cups of chicken broth or enough to cover all of the vegetables. Bring the soup to a boil. Once boiling reduce heat to medium low and let it simmer for about 20 minutes or until asparagus is soft. 3) In small batches puree the soup in a blender. 4) Once soup is pureed warm it up and check that it has enough salt and pepper. Mix creme fraiches and sherry into the soup just before you are ready to serve it. My family enjoyed the soup except for my son who is back on his "anti-greens" kick, (probably polluted at school.) He's get over it, yet again! We all thought it was a tasty soup, but nothing spectacular. It wasn't until I added the creme fraiche and the dash of sherry that it had any complexity. If I were to make an asparagus soup without a recipe, I would roast the asparagus and then add them to a single sautéed onion or shallot. I think the leeks and other vegetables overpowered the asparagus. But all in all it was an appetizing soup and a relaxing afternoon. Just wonderful soup, I love it! I'll replace the chicken broth with vegetable broth though. It's a great Spring soup, hope you enjoy it. Yeah, I thought that peeling all of that asparagus was crazy too. I only used one bunch of fresh asparagus (as it is out of season here) and tinned asparagus, so I only had to peel about six spears. Your soup looks so pretty with the little spear sunray on top. Peeling, fresh, frozen... I can't image it matters in a soup. Yeah, I used to peel too. Now i always buy the smaller stemmed ones so they are tender. I do cut the bottoms off; they are usually stringy. Julia Child says trimmed butts. Really. No trimming required. Only 1 cup of onion sauted. My Julia Child The Way to Cook book is my go to one even more than the original French Cooking ones. This one uses the food processor and has wonderful pictures preblogging. That is a lot of onion, leeks and shallots; use those in French Onion soup. Thanks, I will defer to Julia too... yes, I had really young asparagus very tender no need to peel. I'm with you, Diane. I bought 2 1/2 pounds of small, young asparagus. If I had peeled them, they would have disappeared. I once made a recipe that insisted on peeling asparagus. My vow, never again. Anyhow, I blitzed my soup like crazy and loved the result. Sherry? Yeah, baby, a great idea and something I will add when I serve it tonight. When I was growing up we always had a roast, potatoes, and the works after Sunday church. How did we eat all that food????? Glad to hear I'm not alone in the asparagus wilderness. This time of year especially when they are small and tender why peel? Funny about all the food on Sunday... I guess we were growing. That sounds delicious! It looks wonderful too. Sunday was always the big dinner day in our house as well. A roasted asparagus soup sounds deeeelightful. I skipped the peeling part, too, but I don't think that's why mine came out bad. My asparagus just had no flavor. Sherry is a great idea. The soup needed something to make it sing I thought! Yes, this was good but nothing exceptional. Good idea on roasting the asparagus next time. I think roasting them first would add another depth of flavour. The peeling was VERY time-consuming, I thought, but we enjoyed the soup, especially with a spoonful of Greek yogurt. I like your addition of sherry and agree that roasting the asparagus would be a nice touch, too. Diane, what a lovely and velvety green asparagus soup prepared "your way" - it looks and sounds so very delicious the way you cooked it! I don't usually peel asparagus, but I was going to try for this recipe. I gave up after 5 stalks. This recipe was too fussy as written. I made a quick stock from my asparagus ends and the leek tops. I think I'll saute the asparagus like you did next time. I love adding sherry to cream soups, but You idea to add it to this soup sounds interesting too. I thought this was pretty good. Though I changed up the recipe method too - adding the "good" asparagus to the broth at the end left it bright and green. I made home made corn muffins to go with. But I agree, this wasn't all that amazing (compared to all of the other great ways to eat asparagus), though when I tasted it cold, I liked it better - that's how my leftovers will be eaten. Your soup looks delicious! It was not bright green, though my lighting was yellow. I think the onions affected the color. What an interesting soup! This is a great way to "hide veggies" from my grandkids. Do you know if it would be good served cold? I have not tried it cold but others have and like it. Look delicious! 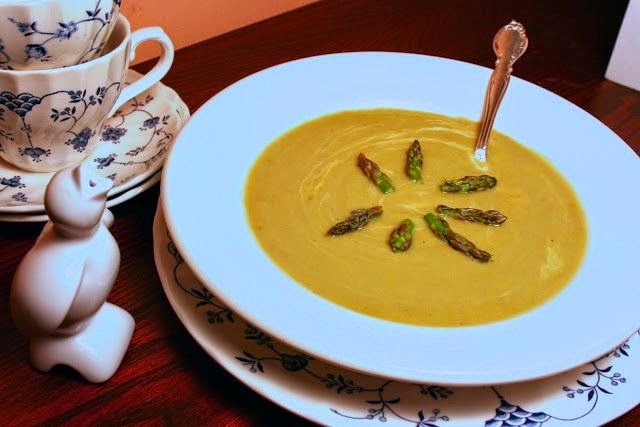 Neither of us have made asparagus soup so we thank you for a wonderful recipe and for sharing it on BeBetsy BRAG ABOUT IT Tuesday. Oh my Diane, I can almost taste this smooth elegance. Thank you so much for sharing with Full Plate Thursday and have a fabulous weekend. It is a lovely Spring soup and if you grow asparagus it is a great thing to do with a big bunch. You are very welcome. I hear what you are saying about leeks...definitely something milder than a regular onion. Oh I adore a great asparagus soup! Thanks for the invitation... I'll head over now. Thanks so much Carole. This is a favorite in my house.